Robert Silva has written about audio, video, and home theater topics since 1998. Previously, Robert was an audio/video expert for About.com. With the increased availability of audio and video content via the internet, there is now a big emphasis on integrating it into the home theater experience. Here are six ways to accomplish this. The most basic way is to connect a desktop computer or laptop to your home theater system. To do this, first check if your HDTV has a VGA (PC monitor) input connection. If it doesn't, don't worry: Simply purchase a USB-to-HMDI or VGA-to-HDMI converter. As for audio, check if your PC has an audio output connection that can be connected to your TV or to your home theater receiver. This may require an adapter plug as well. Most modern computers and laptops have built-in HDMI output connections. If yours does, you don't need any adapter at all to connect it to your HDTV. Once your computer, TV, and/or home theater system are connected, you can use your browser to access a wealth of audio/video content online. You can also play digital media content you've stored on your computer. The downside is that you need to have the computer, TV, and home theater system in proximity. Your computer's video card comes into play here, too; it's responsible for sending images to your HDTV, and this does not always deliver the best results, especially on a large screen. A second option is using a standalone set-top box or plug-in device, usually referred to as a network media player or media streamer. Examples include Roku, Amazon FireTV, Apple TV, and Chromecast. These devices use your existing home network (Wi-Fi or Ethernet) to integrate content from the internet; they can also play audio, video, and image files stored on your computer, as long as it's connected to the same network. The advantage of this setup is that you don't need to physically connect a computer to a TV or home theater system. It can remain in your home office or another location in your home. The disadvantage is that you have added another "box" to your already cluttered home theater setup. Bear in mind that the brand and model of network media player you purchase will dictate which online content providers you have access to. One box may give you access to Vudu, another to Netflix, and another to CinemaNow on the video side. For audio, some units may give you access to Rhapsody or Pandora, but maybe not both. Compatibility with live streaming content providers such as Directv Now, YouTube, and Playstation Vue varies, too. Be sure to check which media player supports your favorite online content. Another method of integrating online media content with your TV and home theater system is using a network-enabled Blu-ray or Ultra HD disc player. Many Blu-ray disc players do more than just play Blu-ray/DVD and CD discs; they also have built-in Ethernet and WiFi connections that allow direct access to a home network. This capability allows users to access both online content associated with the Blu-ray disc they are playing, and audio/video content from live-content providers. The advantage of this option is that you don't have to purchase a separate Blu-ray/DVD/CD player and network media player; you can get both in one box. On the other hand, just as with a separate media player, you are tied into what services the Blu-ray player is associated with. If both Blu-ray and internet content streaming are important to you, you'll have to weigh all the options of both. Even cable and satellite TV services are getting into the act by providing online content streaming for viewing on TV or listening on a home theater audio system. Of course, they do not offer access to sites that would be in competition with their own cable or satellite content. For more details, check out DirecTV, Comcast's Xfinity, and Cox Cable's Watch Online services. In addition to cable and satellite services adding access to internet-based content, TIVO offers its Bolt Unified Entertainment System. In addition to over-the-air and cable TV and DVR functions, the TIVO Bolt adds access to streaming and downloadable internet-based content from Netflix, Amazon, YouTube, and Rhapsody. The TIVO Bolt also can play music files stored on a computer. You can even transfer some content from the TIVO Bolt to portable devices such as an iPod and Sony PSP. A fifth option, which may be practical if you already have a Blu-ray disc player that doesn't include internet access and aren't interested in connecting another box to your system, is to look for a home theater receiver that has internet access built-in. The advantage here is that your home theater receiver is already the connection center for your home theater and has all of the connectivity and features you need. Why not add internet radio and other audio/video streaming functions to the equation? Some of the internet streaming services available through a growing number of network-enabled home theater receivers include vTuner, Spotify, Pandora, Rhapsody, and Apple AirPlay. Check out our suggestions in the budget, mid-range, and high-end model categories. The final (and most popular) option that combines the internet with your home theater is a Smart TV. Also, several TV brands incorporate the Roku platform (referred to as Roku TV) into some of their sets; these include Haier, Hisense, Hitachi, Insignia, RCA, Sharp, and TCL. 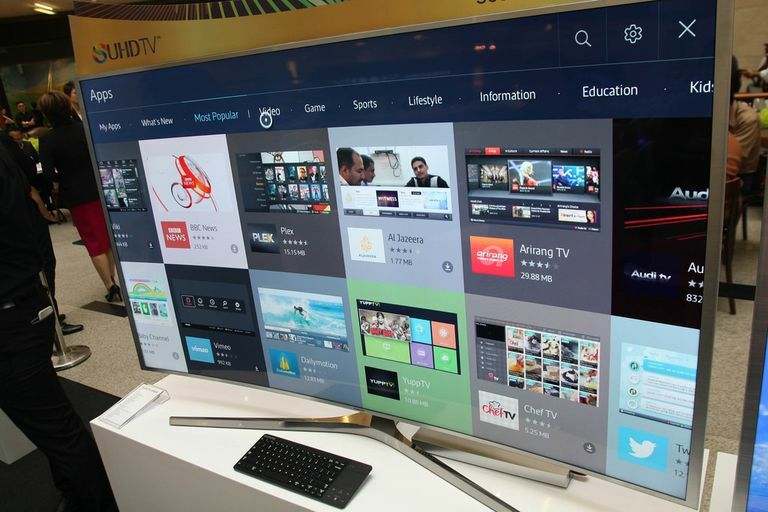 With a smart TV, you don't have to turn on anything else except the TV to enjoy internet content. On the other hand, just as with most of the other options discussed, you are tied to the content providers your brand/model TV is associated with. If you switch out your TV for another brand later on, you might lose access to some of your favorite content sites. If current trends continue, however, most content providers will become available on most brands and models of internet-enabled smart TVs. If you haven't added the internet to your home theater setup yet, you're missing out on a lot of entertainment options. There are a few pitfalls to be aware of, though. For more on this, check out The Pros and Cons of Accessing the Internet on a Home Theater. Can You Make a Home Theater Wireless? Home Theater Gadgets for $199 or Less! What Is a Network Media Player?